Have you ever struggled to get dinner on the table? Have you ever felt like your head was spinning after being asked the question, “What are we having for dinner?” Has the subject of dinner ever started an argument in your house? If you answered yes to any of these questions, then you probably need to start menu planning! Now before we start, I have to confess that I am not a die-hard menu planner. I don’t spend a lot of time making out a plan, and when I make a plan I like to leave myself some wiggle room. Sometimes things come up, and we just don’t have the time or frankly, we don’t feel like cooking! I also reserve a right to change my mind and my husband reserves a right to change his mind, and when that happens, we divert from the plan! BUT…overall I find that the week goes a lot smoother when I have a menu planned out. One of the most skillful cooks in a good restaurant is the “saucier,” a specialist in making sauces. He – or increasingly, she – is often the highest-paid member of the kitchen staff, after the chef. The saucier’s skill makes the difference between a good dish and an outstanding dish. Some of these sauces are prepared right in the pan after the entree is cooked. Chefs describe them as “a la minute,” a French phrase meaning they’re made to order each time. Informally they’re called pan sauces because they use the bits and juices left on the pan. Pan sauces taste impressive and they’re easy to make with a bit of practice. Here’s how to make a pan sauce with lamb chops. The same basic technique works for any other pan-seared entree. You need to prepare a few useful ingredients in advance. The most important is some broth to provide the body of the sauce. Make lamb broth if you have the chance or use commercial beef broth. Try to find a brand with low salt. Simmer the broth until about 1/3 of it has evaporated, then freeze it in quarter-cup portions for later use. Another useful ingredient is red wine or dry sherry, simmered down to a thick and syrupy consistency. It adds a lot of flavor without diluting the sauce. Sear the chops in the hot pan to brown and crisp the surfaces. Then reduce the heat slightly and cook the chops medium-rare. Browning is important because that’s where the sauce gets most of its flavor. Take the chops out of your skillet and set them aside to keep warm under a loose cover of aluminum foil. Pour a splash of red wine into the pan and swirl it around. Let it reduce down to about a spoonful, then add a quarter-cup of broth. Stir the pan vigorously with a wooden spoon or a silicon spatula, scraping the bottom to lift up and dissolve the browned-on juices from your lamb chop. Bring it to a quick boil and let the sauce reduce to concentrate the flavors. Taste the sauce as is simmers. If it needs more flavor add a few drops of the concentrated wine. 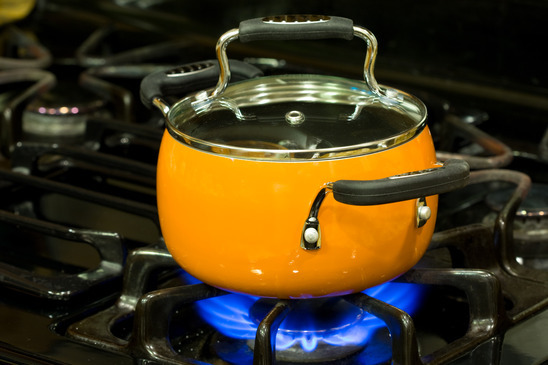 the sauce by dropping a half-teaspoon of cold butter into the pan and swirling or whisking it in. Butter gives the sauces added richness and an attractive sheen. For a restaurant-style presentation spoon the sauce over your chops and drizzle a small pool of it in a semicircle around the plate. If you are looking for a last minute gift idea for the home cook who has everything, consider giving them a Whirley Pop popcorn popper. Everyone loves popcorn, right? And they will especially love some freshly popped popcorn for movie nights. 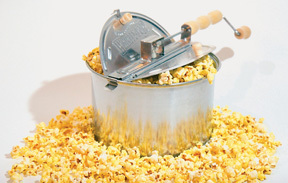 With the Whirley Pop popcorn popper, movie nights are even more fun! 4. Hold the wooden handle with one hand, and slowly turn the crank with the other. Continue stirring for about 3 minutes or until you only hear an occasional pop or the crank becomes difficult to turn. To make movie nights and parties even more fun Whirley Pop also sells fun supplies like popcorn bags and tubs. And when it comes time to party or just snack around, you don’t have to stick to the buttered popcorn, because they offer the supplies you will need to make all sorts of flavored popcorns with your machine. Their flavors include chocolate, caramel, red cinnamon, blue raspberry, grape, and cherry pink. And for even more fun gift ideas and movie fun, Whirley Pop offers all kinds of party packages, which include a variety items like popcorn making supplies, seasoning, popcorn bowls, snack trays, movie size candies, and more! After Christmas you can also check out Whirley Pop for birthdays, weddings, housewarmings, and corporate gifts. On Wednesday night, I’ll be posting my Blog Mania giveaway, and one of my featured sponsors is Eco-Foil. They make 100% recyclable aluminum bakeware. As someone who does a lot of baking, I was super excited when I got the chance to do review their products and share them with you.